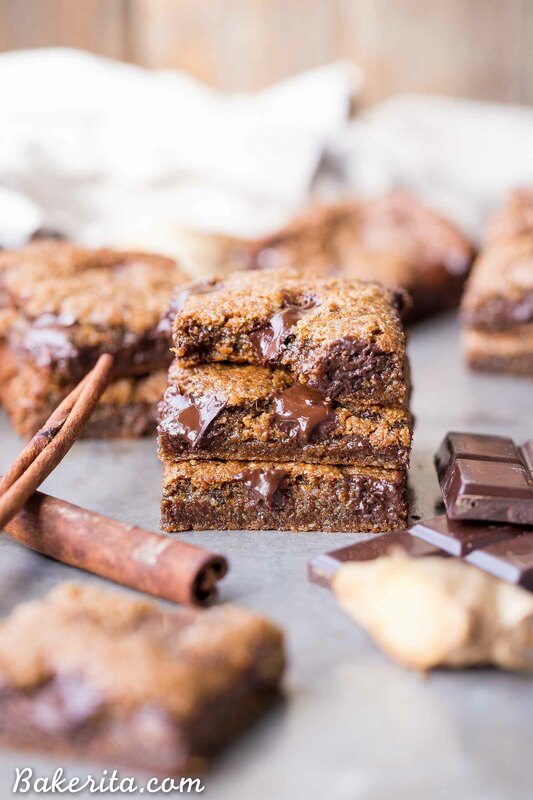 These Chocolate Chunk Gingerbread Blondies are chewy, chocolatey, and full of warm gingerbread spices. 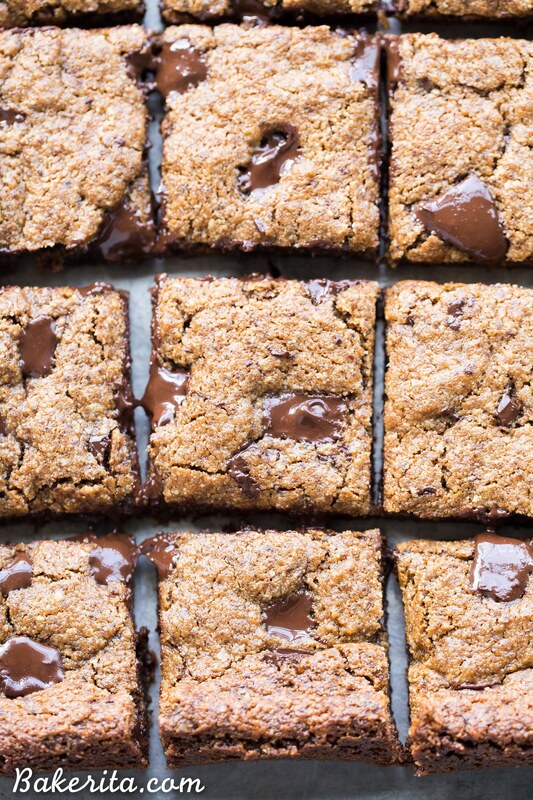 You can get the batter ready for these easy, gluten-free, paleo, and vegan blondies in about 10 minutes. They’re perfect for the holidays, or any time of year when you’re craving a gingerbread treat. I did a poll on my Instagram stories the other night, pitting GINGERBREAD and MINTY GOODNESS in the battle for the best holiday flavor. Which would win, warm spices and molasses, or the world of cool mint chip and peppermint bark? Surprisingly to me, gingerbread blew mint out of the water. I don’t remember the exact numbers, but it was something like 64% for gingerbread and 36% for mint. A pretty big blow to mint, if you ask me. I hope these Chocolate Peppermint Cups aren’t offended. I then did a follow up question: chocolate with your gingerbread, or nah? Results were in favor of YES (unsurprisingly), but there were a fair number of NO WAY’s too. For the purists, chocolate chunks can always be left out for a more *pure* gingerbread. I started classic though, with one of my favorite treats: blondies! 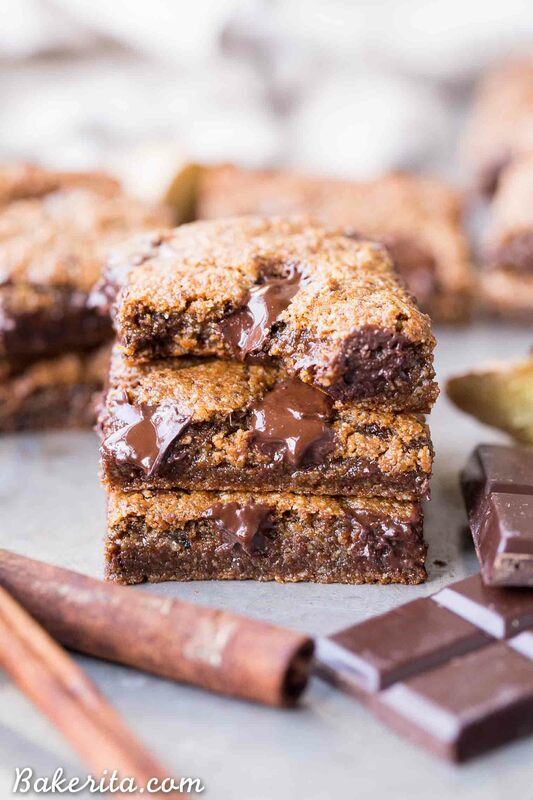 The recipe for these Chocolate Chunk Gingerbread Blondies actually came together pretty easily, and turned out exactly as I had hoped on the first try. They’re chewy, warmly and perfectly spiced, with the sweetness of molasses and chocolate creating an irresistible holiday treat. They use cashew butter for richness and chewiness – I love the buttery flavor of cashew butter, but any other smooth nut butter of choice will work too. They’re sweetened with coconut sugar and also have molasses, for that classic gingerbread taste. I use blackstrap molasses or date molasses here to keep them paleo. Of course, it’s not gingerbread without warm winter spices, including a hearty dose of it’s namesake, ginger! This recipe uses 2 teaspoons of ground ginger, which makes for a mildly spicy bite. If you want some extra kick, you could add candied ginger or even some fresh ginger. Cinnamon and nutmeg are added to complement the ginger. 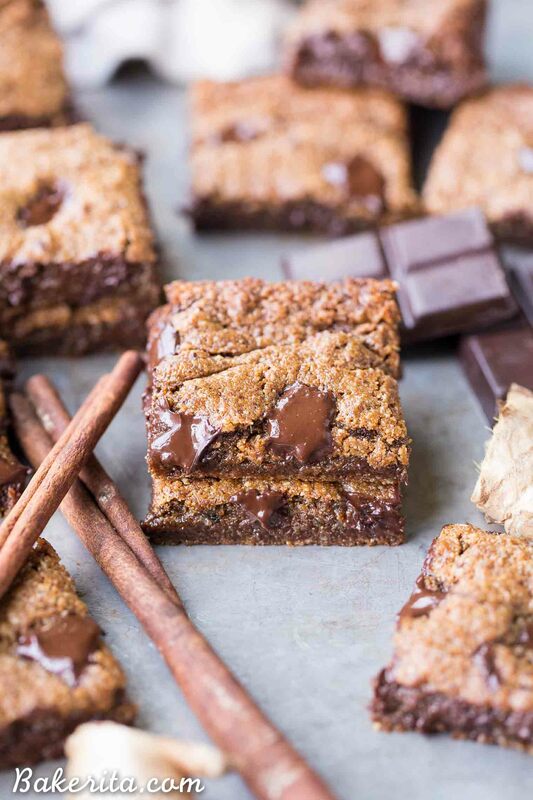 These Chocolate Chunk Gingerbread Blondies are chewy, chocolatey, and full of warm gingerbread spices. You can get the batter ready for these easy, gluten-free, paleo, and vegan blondies in about 10 minutes. They're perfect for the holidays, or any time of year when you're craving a gingerbread treat. Preheat oven to 350°F. Line an 8x8” square baking pan with parchment paper and spray with nonstick spray. Set aside. In a bowl, whisk together the cashew butter, coconut oil, coconut sugar, molasses, flax egg, and vanilla extract until smooth and combined. Stir in the almond flour, coconut flour, baking soda, ginger, cinnamon, nutmeg and salt. Fold in the chocolate chunks. Spread evenly in prepared pan and bake for about 20 minutes, or until lightly browned. Cool completely, and then cut into 16 squares. Store in an airtight container. Shut the front door, these look fantastical. I love the chocolate puddles ! Oh my gawsh the gooooo!! 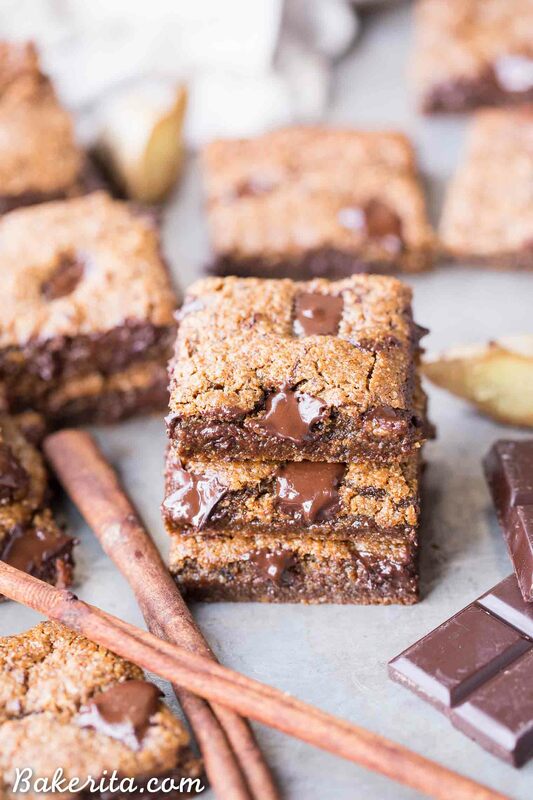 I’m always game for all-things gingerbread and I love the addition of chocolate. These are making my mouth water like crazy! Thanks so much for the love Julia! These look amazeballz! I’m definitely making these! I’m on the fence regarding one thing though; should I cut the sugar back, or should I just roll with it because it’s the holidays? I’m leaning towards the latter. Hi Rick, they’re definitely on the sweeter side, so you could definitely cut back a bit and still have a delicious blondie…especially if you’re using the chocolate :) but if there’s any time of year to try them with the amount of sugar called for, it’s the holidays right?! Enjoy! They look so yummy!! Can a regular egg be used instead of the flax egg? Oh my, yesssss! These are gingerbread goals, Rachel! Chocolate and gingerbread together is my LOVE language!! Thanks for the love, Sarah!! Hello Rachel! Do you have nutrition facts for those? How come some of your recipes have nutrition and others don’t? Love your site and what you do!! Hi Beth, I have to manually add nutritional info and it takes a while for each recipe, so I generally only do it if it’s a health-focused recipe (not dessert) or if someone asks. I’ll add it for you in a minute! Hi Rachel, could I substitute 1 regular egg for the flax egg? I know it won’t be vegan anymore but I don’t have flax seeds.